I don’t know about you, but I find it hard enough motivating myself to stay physically active when it’s warm out, let alone in the winter when I’d rather do nothing more than curl up under a cozy blanket with a good book. Here are some suggestions to help you and your kids stay active in the winter months. If you have a wood-burning fireplace, chopping and hauling wood can be great exercise. Make a family event of gathering wood. Visit the local garden centre and get your kids to help you lug a cord of wood into the back of the car. Make sure everyone wears safety gloves to avoid splinters, and monitor little ones carefully. Give them one small log at a time to carry. We have our wood delivered in a pile on the driveway. That’s when we enlist our kids to haul it around and stack it on the back porch. It’s a great workout for the whole family, and it’s good for kids to see they’re making a valuable contribution. I once interviewed a 79 year old arthritis patient who told me that the best way to combat his symptoms was by walking five miles a day. But we live in Canada, so in the winter months he’d do five circuits around the local mall instead. Shopping with kids can be a nightmare, so why not tire them out before you even begin? A warm mall can be a great place to expend some energy when it’s icy and cold outside. And you can end your indoor hike with a healthy treat from the food court. 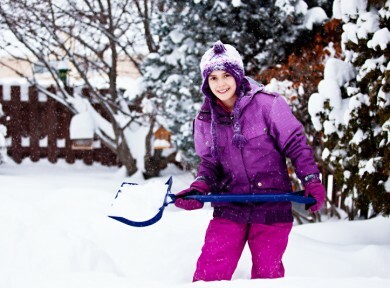 Nobody likes shoveling snow, but it makes a great workout. After shoveling for an hour or so, I’m nursing muscles I didn’t even know I had. This is another good time to include your children in your household chores, while letting them get some fresh air. You can supply them with some kid-sized shovels, but don’t be disappointed if they don’t make a big dent in your drifts. Just the pleasure of their company might make your load a little lighter! Make a snowman, build a fort, or engage in a snowball fight. What better way to burn off some calories than by having fun? Encouraging your kids to get outside in the winter is easier when you get out there with them for some snowy horseplay. If you’re anything like me, you worry about the amount of time your kids spend playing video games. But with Wii and Xbox Kinect, video games offer kids a lot more opportunities to incorporate movement into their play. There are plenty of dance, adventure, and exercise programs to choose from that are fun for kids and grownups alike. So grab a controller and get moving. Your kids will love watching you trying to keep up almost as much as they like playing themselves! Consider it an early Spring Cleaning. When you’re cooped up in the house, it’s a perfect time to clear out some clutter and another chance to get moving. Make a game of cleaning up with your children. Have a race to see who can fill a box of toys first. Let them be involved in deciding which toys will be put away in storage or given to the thrift shop. Cleaning with kids can take extra time and patience, but it’s a good way to teach your little ones responsibility and it’s better than sitting around in front of the TV. A simple way to incorporate exercise into your daily routine in the winter is to skip the elevator and take the stairs. Whether you’re at the mall or at the office, this is one small change that can make a big difference. Take up a new sport with your family. There are many fun activities you can do together as a family. Skiing, skating, snowshoeing – even tobogganing is a wild ride with a built-in work out as you make that trek back up the hill. Winter is the perfect time to introduce your children to a sport you enjoy, or for all of you to try something new together. Mandy Webster is a writer at Ganz and the author of the middle grade Young Marian series, including A Viper in the Forest and Echoes in the Cavern. She’s also an artist and graphic designer whose work has been featured in InStyle, Redbook and Style at Home. A mother of three, Mandy has worked as an advertising copywriter as well as contributing to publications such as Playback, Strategy and Canada On Location. My children love to ski.